Tossa jute is the famous type of Jute having scientific name is Corchorus olitorius. 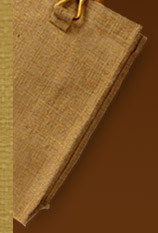 This is the most commonly found jute type along with white jute. This type of jute is highly produced in India making the country the world's top producer. This is cultivated in the soil of Bengal region mainly in West Bengal. Tossa Jute is known for its high content of vitamin C, protein, beta-carotene, iron, calcium, and other minerals. Hence, tossa jute is widely used as an herb among African and Middle Eastern countries. In these parts, leaves of the jute are used as major ingredient in a mucilaginous potherb that is reckoned "molokhiya". In addition to this, it is in huge demand in the Arab countries that includes Jordan, Egypt, and Syria as a soup-based dish. It is also used with meat over rice or lentils. In India, Southeast Asia, and the South Pacific countries, this type of jute is used mainly as fibre. The fibres of tossa jute are stronger, softer and, silkier than white jute, the other variety of Jute. This has excellent sustainability factor in extreme conditions as well that may include the climate of the Ganges Delta. As per the different needs, it is available in varied grades starting from A to E.
Unmatched features of tossa jute make it perfect for varied industrial use. Its extra durability and strength make it ideal to manufacture bags such as gunny sacks and other packaging materials to store and ship varied goods including sugar, coffee beans, salt, etc. As it can easily resist condensation and spoilage of the contents, it is considered as the good option to keep the goods safe and damage free. High strength, sturdiness and resistant to wear and tear are the features making tossa jute able to rough handling during transit.